Whenever we think about intelligent robots, we usually refer to futuristic movies like Star Trek or sci-fi novels like 2001: A Space Odyssey. But as computers become faster and faster and technology becomes ever more sophisticated, the gizmos and gadgets of our fictional worlds are becoming realities. Recently, IBM, one of the earliest computer manufacturers, pitted their very own artificial intelligence computer system against contestants of the popular American trivia show Jeopardy! The televised game show normally features three contestants who respond to different clues to which they provide the questions. For example, contestants pick from one of several general categories, like History, Movies, or U.S. Cities. The show's host will provide a clue like, "This city is the capital Ireland", to which contestants must answer in question format, namely "What is Dublin?" Watson, the AI computer system named after IBM's founder, was developed by several computer experts from IBM and a handful of universities. After the defeat of Chess champion Garry Kasporov by the IBM developed chess-playing computer Deep Blue, IBM had been trying to find a similar challenge to showcase the power of AI mega-computers. In 2004, developers found that challenge in Jeopardy! In 2006, when developers first began working on Watson, the computer could answer questions correctly only about 15% percent of the time. By 2008, with a dedicated team of 15 people, Watson was able to compete with most of the quiz show's champions. So how does Watson work? Watson is basically a system of computers that has a large amount of information stored into it, including the full-text of Wikipedia. Watson was not connected to the Internet during the show, but had a stored database of over 200 million pages of information. 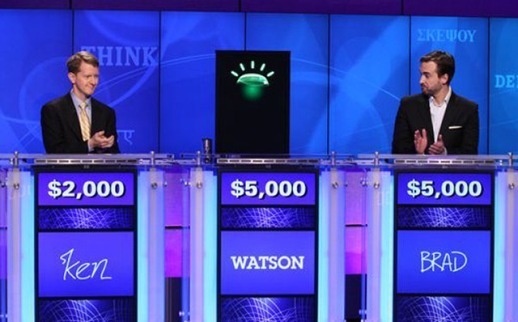 Using very complex algorithms, Watson decodes the clue given by the host and searches its database for related keywords and phrases, after which he checks his answer statistically to see which of three responses he comes up with is most probably correct. Although Watson is by no means perfect (he answered the Canadian city Toronto in response to clue categorized under "U.S. Cities"), the computer system has several advantages over human players, like being immune to psychological tactics that hinder a human's ability to do well on the highly stressful and competitive show. What's more, what makes Watson unique among most robots is that it can understand puns, riddles, and subtle meanings that are often required to get Jeopardy clues right. Last week, Watson beat the longest-running champion in Jeopardy history, Ken Jennings. After his defeat, Jennings conceded that he "welcomes our computer overlords." Watson won one million dollars, which was donated to charity. Now, researchers are trying to find different areas of application for Watson-like computer systems, including in the medical and legal fields. For more information about how Watson works, see this IBM blog article. Interested in discovering what it feels like to be beaten by a supercomputer? Read Ken Jennings' opinion article published in Slate Magazine.